PE lessons will be every Tuesday. Please make sure your child has a clearly labelled indoor and outdoor kit in school at the start of each half term – this will be returned at the end of the half term. We have enjoyed an array of Easter activities this week. One of our favourites was our Easter egg hunt, organsed by the children in the Ethos group. We started with an egg and spoon race, where we competed against each other to see who was the quickest to cross the line with the egg still on the spoon. Well done to our champion, Max! When we arrived back into our classroom, we had an Easter egg hunt. We all searched high and low, and in the end we all found an egg to take home. A big thank you to the Ethos group – we had a fantastic time! Today we re-enacted Jesus’ Passover meal with his disciples. We looked at a chalice and a paten and thought about what they might be used for. We then learnt about the last supper, and remembered how Jesus shared bread and wine with his disciples. We really enjoyed celebrating world book day in school on Thursday. We all came dressed in fantastic costumes, and were confident to share our favourite books and characters with the class. Take a look at some of our super costumes! In Maths this week we have been learning all about picture graphs. We have really enjoyed interpreting data, creating tally charts and making our own picture graphs. Take a look at our fantastic work! We all really enjoyed our afternoon at Westbrook Library. We learnt all about how the books were sorted in the library, and all of the different activities that you can do in the library. It’s always a pleasure to take the children to the library, and it was so lovely to see all of the children’s love of reading ignite through our visit. This week it has been ‘health and well-being week’ in school, and we have enjoyed thinking about how we can make sure that we have a healthy body, and mind. We have read the book ‘Words and your Heart,’ and have thought about how words can have an impact on other people. We thought that it was really important that we say kind, encouraging words to each other, to make sure that our heart is healthy and happy. We have also really enjoyed our daily exercise, especially the skip-a-thon and clubbercise! This week we have started to learn about different shapes that we can make with our bodies. We enjoyed making pike, tuck, mushroom, straddle and star shapes, both stood up and lying down. Using these shapes, we worked in groups to make different letters of the alphabet. Can you guess which letters we have made? Today we all wore our fantastic Christmas outfits to raise money for ‘Save the Children.’ We learnt all about where our money was going to, and the impact that it would have. We didn’t think it was fair that some children aren’t as lucky as us – that they don’t always have a cosy bed to sleep in, or a nice warm meal at the end of the day. Don’t we all look very festive in our Christmas jumpers? We have thoroughly enjoyed performing our Christmas play this year, called ‘Born in a Barn.’ We all worked really hard to make sure that we were speaking and singing clearly and using lots of expression. It has definitely got us all feeling very Christmassy. We hope you enjoyed it just as much as we did. Merry Christmas! We have really enjoyed learning to play the recorder this half term. Mrs Bright has been very impressed with our rhythm and beat. We had a fantastic day in Liverpool. Our first stop was the Cathedral, where we enjoyed a class worship in the Lady Chapel. We thought the stained glass windows were beautiful and sketched our favourite. Then we went on a tour, which was fantastic and we learnt lots of interesting facts about the Cathedral. Our final stop was the waterfront, and we loved looking at the statue of The Beatles and the different buildings along the waterfront. What a fantastic day we had! Today we used artefacts from Warrington Museum to predict what the objects were for. We all thought that they were objects from the past, but we all guessed different purposes for them. Some of our predictions were a bin, gardening tools, a teacup, a toy box, a stool, preserved food, scissors and hair clips. What is the best way to wash our hands? During the first few days of our topic, ‘Happy, Healthy Me,’ the children all thought of their own questions that they would like to find out the answer to. A very popular question was, ‘what is the best way to wash our hands?’ so we decided to complete an investigation to answer the question. We decided on four different ways of washing our hands; using warm water and soap, cold water and soap, just cold water, and just soap. After our investigation we concluded that using warm water and soap is the best way to wash our hands, as it got rid of the germs that we can see, and those that we can’t! Today we were really lucky, because we had a special visitor from ASDA. We tried lots of healthy foods like raspberries, mango and pineapple, and Miss Ramsey was very impressed with how willing we were to try new fruits! Using the fruits we liked the best, we made our own fruit and yogurt dessert. All of the children have made a super start to year 2! I am very impressed with their maturity and their super attitude to learning. We have enjoyed starting our new topic for this half term called ‘Healthy, Happy Me,’ where we have used tally charts and bar charts to try and find out which is our class’ favourite sports, and linked colours to emotions in our art lessons. What a fantastic week we’ve had! As part of our ‘Let’s Play’ project we had a fantastic dance lesson about old toys. We thought about how the different toys might move. We pretended to be a clockwork toy that needed winding up, but then slowed down as it unwound. We looked at spinning tops and thought about how we could turn our bodies on different body parts and at different levels. We then looked at the game Cat’s Cradle and experimented with how to make different shapes with elastic. We worked in partners and groups to make some amazing shapes! In Maths we have been learning about time. We made o’clock and half past times on our clocks. Then we did lots of estimating of how long things took to do. We thought about seconds, minutes, hours, days and weeks. We worked out how many times we could write our names in 1 minute. What an exciting day we had on Wednesday. We all brought our teddy bears or cuddly toys to school. We also had a visit from Mrs Kennerley’s class to share our bears with them. This week we had a wonderful afternoon on our scooters. We learnt about how we can stay safe when we ride them and practised weaving in and out of cones. After working hard to manoeuvre around the obstacles we had some time to ride freely around the scooter park. We had so much fun! This week in maths we have been learning about fractions. We did lots of exciting activities finding halves and quarters. Our class recently received a letter from Dr Grey – a zoologist who works in Jurassic Park. He told us that a friendly dinosaur called Daisy had escaped from the park! In our classroom we found green vines, dinosaur footprints and a nest that had an egg in it. We were a little bit unsure as to what could have been in our classroom. We watched the CCTV footage and found that Daisy the Dinosaur had been in our classroom! We reported back to Dr Grey and told him all about what we found. We were sent a box that gave us instructions on what to do with the dinosaur egg. It told us that we had to put it in water so that the dinosaur could hatch. We wrote wonderful predictions of what we thought would happen when the egg goes into the water. After a week, the dinosaur started to hatch! We read the story How to Grow a Dinosaur by Caryl Hart. This story is about a little boy called Albie who woke up one morning and realised that he had grown his own dinosaurs! We thought about what else we might be able to grow. There were lots of very creative ideas! We designed seed packets for our ideas and wrote stories all about our lands. What an exciting day we’ve had! We started our morning in Walton Gardens. We explored the sensory garden, the pond, the woodland walk and the beautiful gardens. After that, we visited The Children’s Zoo where the peacocks were showing off their fabulous feathers. We enjoyed lunch in the band stand and then set off towards Grappenhall Heys Walled Garden. When we arrived, we went into Mr McGregor’s Garden. We had to keep an eye out for Peter Rabbit! Kate showed us the plants in the garden – we had to try and guess what was growing. There was rhubard, garlic, broad beans and lots of other yummy fruits and vegetables. In the green house we sowed some Sweet Pea seeds. We had to use a dibber to poke holes in the soil so that our seeds could be buried deep into the pot. We even decorated our own sticks to put in our plant pots. This half term we looked at some of the main cities in the UK. In particular, we looked at London and why it is such a busy city. We had a fun filled afternoon with our clipboards and paper watching videos, reading information and looking at pictures to help us learn lots about London. We found out about The London Underground, Big Ben, The London Eye and Queen Elizabeth’s guards. After this we made some beautiful posters that shared lots of information and research about London. Within mathematics, we have been learning to compare the height and length of various objects. We thought carefully about the types of things that we could use to measure. We used paperclips to measure pencils and crayons, and then came up with our own units of measure using objects found in the classroom. After this, we started to think about what body parts we could use. We had great fun measuring our friends with our hands and feet! This half term we have been learning lots of new skills within Tennis. We have been learning how to strike the ball, defend, move effectively in our space, and to be aware of the ball and people around us. After learning about the astronaut Helen Sharman, we thought about how astronauts travel to and from Space. We learnt that they travel back to Earth in a capsule which has a parachute to make sure it lands safely on the ground. We made our own parachutes out of plastic bags and string, and attached them to a cup which represented the capsule. Each group was given an astronaut that they had to protect when the parachutes were dropped. We thought about how we could keep the astronauts safe by putting different materials in the cup. Lots of us predicted that the cotton wool would keep the astronauts the safest. In groups we tested cotton wool, napkins, paper and cotton sheets, and watched for which material was the most effective. We have been carrying out lots of experiments during Science Week. Today we made a Balloon Rocket! We tied some string to two chairs, put a piece of a straw on the string, blew up a balloon and then attached it to the straw. When we let go the balloon flew from one chair to the other! We made predictions about what would happen when the balloon was blown up just a small amount, and when the balloon was blown up a lot. We had a very exciting visit from the author Caryl Hart. She read one of her books called ‘Say Sorry, Sidney’ which is about a blue rhino who escapes from a zoo and gets up to all sorts of mischief! We then had a workshop with her where we created our own characters for a story. After that, she taught us how to create a story from a few pictures. We had a go at doing this with a partner and then we read our stories to the rest of our class. What a fun day we had! This week we woke up to streets covered in snow! The children were very excited to put their wellies on and go onto the playground with their friends. After our exploration, we wrote fantastic descriptions of the snow. To end our project ‘Animal Kingdom…Grr!’ the children worked in pairs to design and create an animal enclosure. First of all they had to decide which animal they were going to create a living environment for. They then thought about some words they could use to describe the type of environment these animals will need. They worked together to design the enclosure whilst thinking carefully about the ways to improve their work. Once we had our improved designs in place we set to work on our models. The children were given cardboard, plastic, paper, artstraws and coloured pencils to choose from. They had to think very carefully about which material to use for each part of their enclosure! The children then had some time to show off their models to the rest of the class. We were all very impressed by how much hard work and thought went into each and every enclosure! The children have loved learning a new style of dance this half term. They have worked extremely hard on learning, perfecting and performing their Bollywood routine. This week they finished their dance and performed it in front of a Year 4 class. Have a look at their fantastic dancing below. Year One had a fantastic day at Knowsley Safari Park as part of the project ‘Animal Kingdom…Grr!’. We went on a coach around the safari and learnt a lot of facts about the animals. One of our favourite facts was that antlers are made out of bone! We really enjoyed watching the cheeky baboons jumping onto cars. We ate lunch whilst watching the sea lion show. It was such a great experience watching the animals’ tricks. We then went on ‘plane’ to Africa where we learnt lots of information about meerkats and giraffes. Did you know that there are 7 bones in a giraffe’s neck and that their tongues are black so that they can’t get burnt by the sun? After our trip to Africa we went to the Safari School to learn all about animal classifications. We learnt that all mammals have hair, and that ‘amphibian’ means ‘two lives’. We were introduced to the beared dragon called Logan and the snake called Anna. Some of us were very brave and stroked them! Have a look at the video below to see pictures of our grrreat day out! This half term we have been learning lots of gymnastic skills within P.E. In particular, we have been looking at balancing. We have learnt that a point balance is where you balance on a small area of your body e.g your hands and feet. A patch balance is where you balance on a large part of your body e.g your tummy or back. As well as this, we have been practising balances with a partner. We explored counter balances, tension balances and mirror balances. Today we were very excited to practise all of these skills on the climbing frame! We had lots of fun exploring different ways to balance and use the apparatus. This term we have been looking into how to classify animals. We have been sorting animals into mammals, reptiles, fish and birds. We started to look a bit further into mammals and how we can distinguish them from other types of animals. To help us, we labelled the body parts of a human. We found that all mammals either have 4 legs, 2 legs and 2 arms, or no legs at all! Throughout Health Week we thought about the Christian value of Wisdom and discussed how to make good choices to keep our hearts and minds healthy. We read the book ‘Words and Your Heart’ and thought about how our words can affect ourselves and the people around us. After thinking about using kind words, we thought about what else we could do. We made sure that we did 30 minutes of exercise each day and considered the types of food that we eat. We designed and created our own animals out of fruits and vegetables. They were delicious! This week in maths we have been looking at numbers to 20. We have been practising writing the numbers as words. 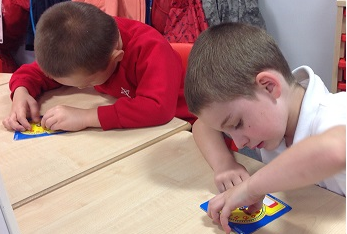 To help us with our learning, we played a memory game where we had to match the word to the number. This week we have been looking at different types of books. We compared a non-fiction book to a fiction book to see if we could spot some similarities and differences. We then explored the features of a non-fiction book such as the contents page, the glossary, the index, page numbers, photographs and labels. The children were then given the task of finding these features in their books. After reading the story ‘Poles Apart’, the children were interested in the different places that Penguin and Walrus visited. We decided to look further into what these places might be like to visit. The children drew pictures and wrote interesting words and sentences to describe their chosen place. We then added ourselves into the drawing to create some interesting scenarios that could occur in these places. This helped us to plan a story. We have loved putting together and rehearsing our Christmas play ‘Prickly Hay’. The children have worked so hard and we hope you enjoyed the show! During Computing this term we have been working with Beebots. We have spent a lot of time looking at the different parts of Beebots, and following algorithms to make them move. We drew our own maps with specific buildings and areas, and created our own algorithms that others could follow to help our Beebots reach the destination. Take a look at the photos below. As part of our seasons project we looked at the artist Andy Goldsworthy. He creates art and sculptures out of natural materials including leaves, sticks and stones. We looked at lots of pictures of his artwork and watched a video of him creating a piece of art out of slate. From this, we came up with our own designs and went outside to create them. We found an area with lots of leaves and sticks and had an exciting afternoon creating Andy Goldsworthy inspired art! Within Design Technology, we read Goldilocks and Just the One Bear. In the story the bear struggled to find a nice place to sit so we decided to design and build our own chairs for the bear. It was quite difficult deciding which material would make the strongest and comfiest chair. We used play dough, stickle bricks, junk materials, blocks and lego. When our chairs were made we sat the bear on them to see if the chair was strong enough. A lot of our models needed improving! Once we improved our models the bear was able to sit on all of them! This week we took part in a Lego Workshop where we built our own models of buildings. Stephen told us that it was very important to overlap the lego to make sure that our buildings were strong. At the end of the day we were shown how to put a bulb in our buildings so that we could light them up. We then put all of our models together to create a huge lego town! It was such a fun day. Take a look at our wonderful creations below. This week we carried out a science experiment to find out which food would make the strongest beanstalk. We worked in groups to build beanstalks out of biscuits, chocolate, marshmallows and strawberry pencils. We used string, masking tape, blue tac and icing sugar to stick our food together. After the beanstalks were built we observed what happened when a giant stood on top of them. All of the beanstalks fell over except for the biscuit beanstalk! This week we started our new project ‘Down My Street’ by thinking about different types of buildings. We had lots of fun making our own buildings out of a range of materials. Have a look at our fantastic models!